Ginnie has a life rule to never say no to food when offered. When she learned that this philosophy could be applied beyond eating, she signed up for classes at WIT. Ginnie has completed the WIT curriculum and taken classes at The Upright Citizens Brigade Theatre in New York. Her improv indie team heart includes Bring Back the 90’s, Latinx States of America (an all Latinx team), and Poetic Resistance. 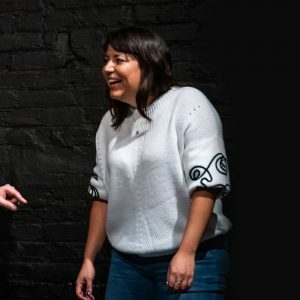 She also holds diversity improv workshops to promote an improv community that reflects the the diversity of D.C.
Ginnie loves doing impressions of her Guatemalan mother, telling people things that Oprah once said, and forcing people to look at photos of her dog Javi (Ha-vi). When she is not doing improv she works as a video producer/editor and spends a lot time strategizing her next opportunities to dance.